The Urban Redevelopment Authority (URA) today launched a hotel site at Club Street for sale by public tender under the Confirmed List of the second half 2018 (2H2018) Government Land Sales (GLS) Programme. This site can potentially yield about 390 hotel rooms. 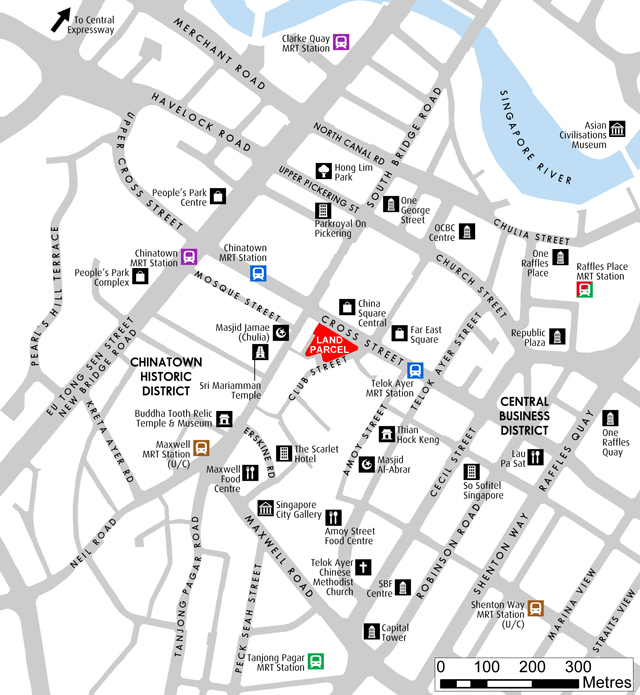 Located prominently along the junction of Cross Street and Club Street, the land parcel of the hotel site is in close proximity to the China Square area and Central Business District – an area envisioned to be an exciting mixed-use cluster with office, hotel, retail and residential uses. The future hotel development will also build on the existing cluster of hotels such as Parkroyal on Pickering, The Scarlet Hotel and upcoming hotel developments at Far East Square and China Square. The hotel site is also located within the bustling Chinatown Historic District – an area rich in heritage and culture and lined with traditional shophouses with diverse retail and food & beverage offerings. It is also close to nearby tourist attractions such as the Sri Mariamman Temple, Buddha Tooth Relic Temple & Museum and Thian Hock Keng temple. (3) Above Mean Sea Level. (4) Computed from the date of acceptance of the tender by the Authority up to date of issue of Temporary Occupation Permit for the whole of the proposed development. The tender for this hotel site will close at 12 noon on 15 January 2019. The tender closing for this hotel site will be batched with two other residential sites at Kampong Java Road and Tampines Avenue 10 which will be launched for sale in October 2018 under the 2H2018 GLS Programme. The URA tender of the hotel site comes at a time when the economy has improved, healthy tourist arrivals have been recorded and the Trump-Kim summit has been successfully hosted. Recognising this, the Government released the hotel site for development (390 rooms) in its Industrial Government Land Sales (IGLS) programme in the 2nd half 2018 confirmed list. The last time a site with a hotel component was included in the confirmed list of the IGLS programme was 7 years ago. In June, besides the hotel site at Club Street, the Government released another hotel site at Marina View in its latest Government Land Sales programme. URA said the sites will allow developers to provide additional hotel rooms to meet an expected growth in demand. In total, the two hotel sites are expected to 930 rooms. In 2017, Singapore registered a growth of 6.2% in International Visitor Arrivals to welcome 17.4 million visitors. With the favourable global economic outlook, the Singapore Tourism Board is optimistic about tourism prospects for Singapore in the next few years. The Government iin releasing two new sites that can supply new hotel rooms at Club Street and Marina View via the 2H2018 GLS Programme, said that these sites will allow developers to provide additional hotel rooms to meet the expected growth in demand. Are you searching for investment property like a hotel site and need a commercial loan, or are unsure if you qualify for one? Don’t worry, iCompareLoan mortgage brokers can set you up on a path that can get you a commercial loan in a quick and seamless manner. Our brokers have close links with the best lenders in town and can help you compare Singapore commercial loans and settle for a package that best suits your purchase or investment needs. Most importantly all the services of the mortgage consultants at iCompareLoan are free as our fees will be paid by the banks. Whether you are looking for a new commercial loan or to refinance, our brokers can help you get everything right from calculating mortgage repayment, comparing interest rates all through to securing the loan. And the good thing is that all their services are free of charge. So it’s all worth it to secure a loan through them. If you want to Find the Most Suitable Loan for Your Property.